The U.S. Federation of the Sisters of St. Joseph is extremely disappointed with the June 26, 2018, United States Supreme Court Decision in Trump vs. Hawaii, commonly referred to as the travel ban. The ban restricts travel from seven countries: Iran, Libya, North Korea, Syria, Venezuela, and Yemen. 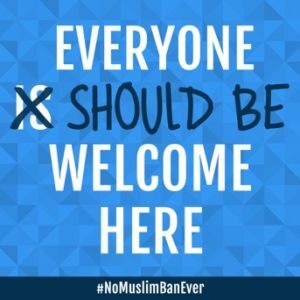 We believe that this travel ban intentionally targets Muslims and that the Court’s decision adds to the climate of fear of Muslims and fuels the flames to anti-Muslim sentiment in the country. The travel ban, aimed primarily at Muslims, contradicts the values and principles of the United States. As Catholic sisters, our mission is one of unity. We are grounded in a loving relationship with God and neighbor. We live the Gospel values and view each person, regardless of their race, religion, or nation of origin as our dear neighbor, whom we love without distinction. We join with the Leadership Conference of Woman Religious (LCWR) and other women religious in the belief that all people are created in God’s image, all are worthy of respect, and all are entitled to the protection of their human rights and religious liberty. We strongly object to President Trump’s continued attempts to use his authority to create policy by fiat, particularly when that policy is used to deny access to our Muslim sisters and brothers because of their religion. Such discrimination violates our deeply held faith beliefs and is inimical to the principles upon which this nation was founded. LCWR joined other faith-based groups in filing amicus briefs in this case challenging the government imposed anti-Muslim discrimination. When religious based discrimination is permitted, especially when sanctioned by those at the highest levels of government, the free-exercise of religion by members of all faiths is threatened.